In the latter half of the Second World War, Germany"s loss of air supremacy created a pressing need for the development of powerful anti-aircraft vehicles to combat the fighter-bombers of the Allies. At first, the focus of production was around the Mobelwagen anti-aircraft vehicle. It was built on the chassis of the Panzer IV tank, and equipped with a single 37mm Flak gun, which was protected on all sides by light armored plates. In the spring of 1944, a new standard was laid down to unify the production of a new anti-aircraft vehicle. The plan included the following: 1) rotating armored turret capable of holding three of four crewmen, 2) guns with effective firing range of 2000m, 3) integrated mount of at least two guns, 4) space for ample ammuntion, 5) body of under 3m in height, and 6) various wireless devices. 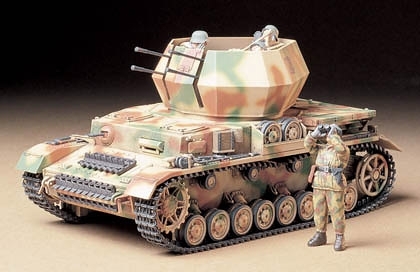 These criteria resulted in the Flakpanzer IV Wirbelwind was its exceptional rotating turret protected by no less than eighteen, 16mm thick armored plates. The open-top turret provide just enough space for the gunner and two loaders to operate effectively. The Wirbelwind could carry 3200 rounds of ammunition for its four 20mm Flak guns, which fired at an angle of elevation of 90, an angle of depression of 10 and a speed of 800 shots/min. The Wirvelwind became the scourge of any plane that flew too low.